Life is always full of problems. How do you solve your problems? In my younger days, I would write all my problems on a piece of white paper. Read them first, then crumbled it and throw that piece of paper into the rubbish bin. At the same time, I would also shout aloud "Go to hell with these problems!" Mentally it helped to erase these unnecessary problems that might disturb my mind. Believe me, it works very well. 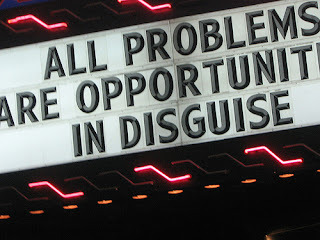 Today there is no problem that couldn't be solved. The only problem that cannot be solved is when one is dead. Death is unsolvable! Other than death, all problems have solution to them. An intelligent person might be disturbed with problems, but a wise person takes problems as opportunities. I write to share and definitely not for profit in any kind.